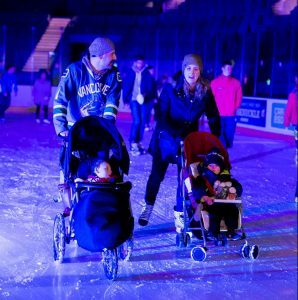 Be prepared to strap in your skates and get ready for a wholesome night at the 11th Annual Lace Up for Kids. We have everything you need to know to convince you to put on your best winter-themed attire, and join us on November 15th for this year’s annual Lace Up for Kids. Want to get involved? Check out the Lace Up Palooza and donate! What’s more exciting than getting into the holiday mood? This year’s theme is Winter Wonderland- so put on those reindeer antlers or that Santa hat that’s been collecting dust in your closet and let’s get the show on the ice! YESSSSS!!! Join UBC students, staff, faculty and community members, or bring a friend, a crush, or your favourite mom to get your skate on! There will be a limited number of rental skates available, so we suggest that you bring your own, borrow a pair, or buy some second-hand skates. 3. More than just skating! If you don’t like skating, do not fret, the event will also include food, a DJ, and a light show! We’ll also be having dance, improv, figure skating performances and more. don’t forget to come ready to bid for items at our silent auctions. 4. You said there was a pre? In addition to the main event on November 15th, many on-campus institutions are also hosting events to raise money as part of the Lace Up Palooza. Learn some sweet moves at a dance class, treat yourself at a bake sale, or join us at a $5 Wednesday Night Dinner- check out all the rest of the events at our schedule! UBC Recreation Intramurals is also hosting Coin Wars, a team competition of who can collect the most $$$! Last but not least, the money raised at UBC Recreation Intramural’s Lace Up for Kids event will go towards the Rare Disease Foundation in collaboration with the BC Children’s Hospital Foundation. When a child is diagnosed with an uncommon disease, there may not be enough research for treatment. In some cases, diseases can be so rare that doctors are unable to form a diagnosis. The money raised at Lace Up For Kids will go towards research and treatment for these children. Donate at www.laceup.ca! Join us November 15th at the Doug Mitchell Thunderbird Sports Centre for a carnival, skating, performances and more- details at our event page. Click ‘going’ so you don’t miss out on any updates! Tag us in you Lace Up photos with #LaceUp4Kids!